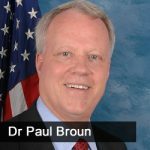 Jason Hartman talks with Congressman Dr. Paul Broun about what’s going on in Washington in regards to policy and the constitutionality of it all. This was recorded prior to the GOP Tax Reform bill passing, but Dr. Broun is a proponent of a tax system that’s more in line with a flat tax. The two discuss the irrational belief people have that the marketplace won’t react to actions the government takes, as well as why the corporate tax rate needs to be reduced (and who that ultimately helps). They also discuss how to make change actually happen, and whether getting rid of the federal income tax is feasible and if it’d be harmful for the economy on the whole. [26:05] Would getting rid of the federal income tax and moving to a sales tax harm the overall US economy? Make the adrenal rush work for you.